I'm Tough! (Hardcover) | Fountain Bookstore, Inc. Anyone who knows me knows I'm a sucker for a good truck and the same goes for books about trucks. I'm Tough! follows a pickup truck that admits to being small, but capable of hauling any load that the bigger, more specialized trucks do. Through some honest-to-gosh hard work and a feisty attitude, Tough gets going when the going gets tough! I'd like to think that I see a little of myself in this truck, 'cause I might be small too but when you need a job done I'm your guy. Ya know why? 'Cause I'm tough! From the popular creators of I Stink! and I’m Dirty! comes the perfect tough addition to their noisy series: a pick-up truck! I’m not the BIGGEST TRUCK in the parking lot . . .
I’ve got what it takes to HAUL it ALL! You can count on me—I’ll get the job done! Kate McMullan is the author of the easy-to-read books featuring Fluffy, the Classroom Guinea Pig, the middle grade series Dragon Slayers’ Academy, and Myth-o-Mania, the Greek myths as told by Hades. She is also the author of the Geisel Honor Book Pearl and Wagner: One Funny Day. 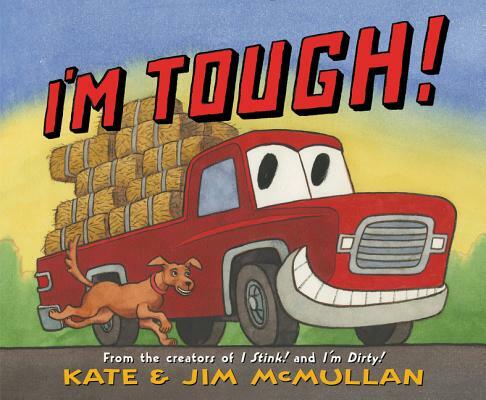 Kate and Jim McMullan have collaborated on many popular picture books, including I'm Brave! ; I'm Fast! ; I'm Big! ; I'm Bad! ; I'm Dirty! ; and I Stink!, a New York Times Best Illustrated Book and a Boston Globe-Horn Book Award Honor Book. The McMullans live in Sag Harbor, New York. Jim McMullan is an internationally acclaimed illustrator and poster designer whose work can be seen in The Theater Posters of James McMullan. His most recent book is the illustrated memoir Leaving China: An Artist Paints His World War II Childhood.